Many in the press are claiming the increase in wages from the February employment report implies the economy is back on track, all is well and things are all looking up. We beg to differ. The average hourly wage did increase by 4¢ to $23.82 for all those employed by the private sector and has increased 2.1% from a year ago. The below graph shows what many are cheering over. Production and nonsupervisory employees wages increased 5¢ an hour to $20.04. The problem is these wages are not adjusted for inflation. In reality a 2.0% increase over a year is historically low, as shown in the below graph for the change from one year ago in hourly wages for production and non-supervisory employees. 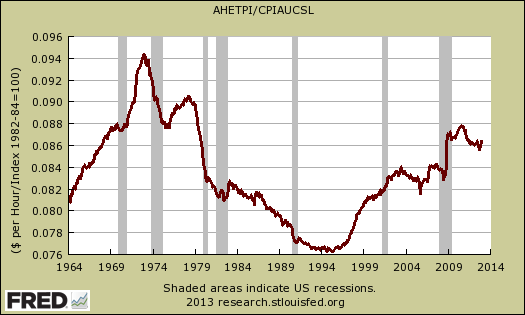 If we divide by CPI to adjust for inflation, wages are really flat. Below is the graph for production and nonsupervisory employees hourly wages using CPI to adjust for inflation, going back to 1964. 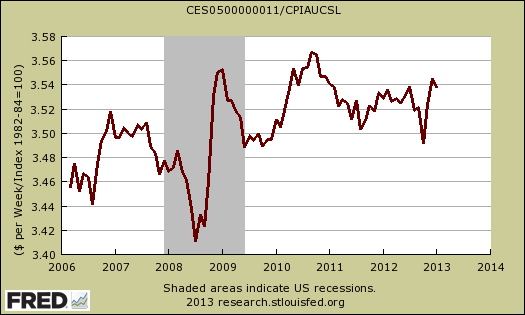 Weekly earnings looks a little better when using CPI to adjust for inflation, they still are not better than even 2010. How many hours worked per week also has declined historically and those stuck in part-time jobs continues to be elevated. Overall hours increased 0.1 to 33.8 hours per week. For production and those in non-supervisory positions, hours increased by 0.2 to 33.8 per week. Hours have improved and have returned to per-recession levels, but this masks the overall decline of full time work as a trend. Rising hours and wages do indicate increased demand for labor, yet one month of an increase does not a pattern make. One has to look at least six months of wage statistics to say there is good news. As it is, February's increase is just nothing to write home about. We suspect people are so sick of the jobs crisis and labor malaise they are grasping at any mediocre statistic to give some sort of feeling of hope this U.S. labor disaster has finally turned around.